Full Packaging, Partial Packaging, and No Packaging. You choose! 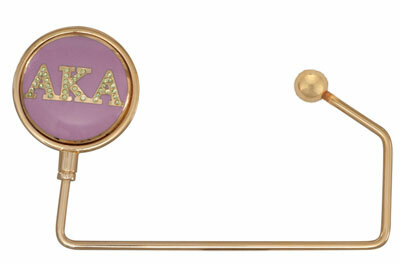 All of our purse hangers are made with high quality brass and 14kt gold plate with the logos made of cloisonné. 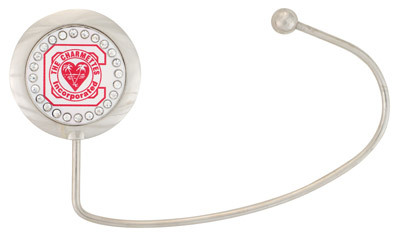 Our silver tone pieces are made of high qulaity nickel again with the logos made of cloisonné. Our artists try to match colors as close as the process will allow however there maybe slight color variation from one piece to the next. THE PRICE ABOVE INCLUDES COLOR LOGOS ONLY. Prices vary when adding crystals or a curved stem (special stem for curved counter tops). Call for a quote. Once we receive your logo artwork exactly the way that you want it ie: layout-colors-whether you want it on a gold or silver hanger we will submit that artwork to our graphic artist. 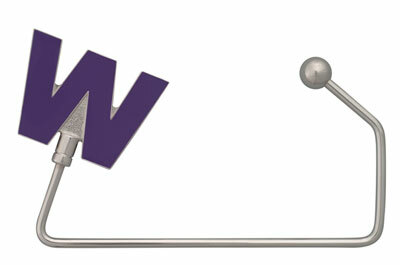 Then we will e-mail you back a complimentary drawing of what your logo will look like. This is the time to make any changes that need to be made because once the artwork is approved and submitted for a working sample there cannot be any more changes without incurring a new tooling fee. It generally takes approximately 7 to 10 days (depending on the schedule of the factory) to receive your sample. One the sample is approved it generally takes approximatley 18 to 21 days for an order of 100 units. For larger orders we have to check with the factory. There is no extra charge for more than one color. Full payment is required for the one time tooling fee. Once the sample is approved and an order is placed, a 50% deposit is required prior to production, with the remaining balance due at time of delivery. The balance is due upon delivery. Allowances can be made with corporations that have to pay the balance in full with one check at time of delivery. Arrangements can be made for payment at the time of placing your order. There are NO CANCELLATIONS once the order is signed and approved for custom orders. There are no returns on custom logo orders. We accept all major credit cards. For all bank wires a fee of $45.00 will be added to your order. This also includes International orders. The custom hangers shown on this page are for viewing only. They were custom made for specific clients and are not for sale to the general public. Let Hot Hang-Up! make your logo or design into a custom hanger. Example of gold with curved stem and ball end. Example of silver with curved stem and ball end. Optional Austrian crystals also shown. 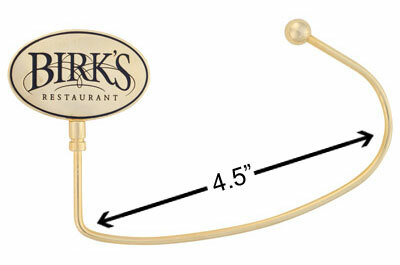 Example of gold with straight stem with wide hook and ball end. Optional Austrian crystals also shown. 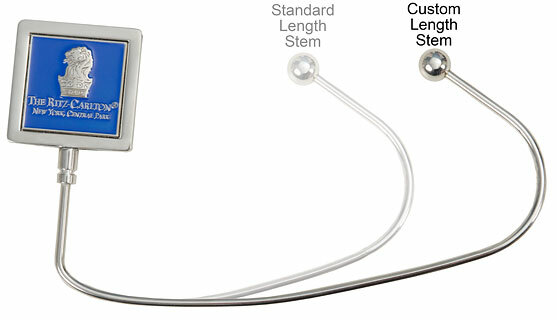 We can customize many aspects of the hangers to your specifications. Please contact us to discuss any special needs! You will find Hot Hang-Ups! 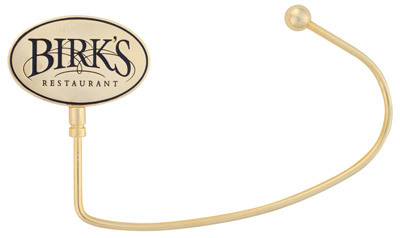 Designer purse hangers in fine dining establishments worldwide as well as being used for Corporate events - Tennis and Golf Tournaments - Advertising campaigns - Store opening - Weddings - Fashion Show Luncheons to name a few. It would be our pleasure to design a custom logo for you, your company or whatever event might arise. For more information and to order your very own customized hangers or the services listed above, call us toll free at 888.831.4879, or locally at 805.522.4003 (Monday through Friday, 9:00 am to 4:00 pm, PST) to speak with one of our Custom Logo Consultants; or email us at customize@hothangups.com. Prices subject to change without notice. For more pricing information call toll free: 888.831.4879 or email us at customize@hothangups.com. ©1999 - 2019 L.J. Enterprises, Inc. - DBA: Hot Hang-Ups! All rights reserved worldwide. No part of this website nor its content may be reproduced by any means for any reason whatsoever without express written permission from L.J. Enterprises, Inc.